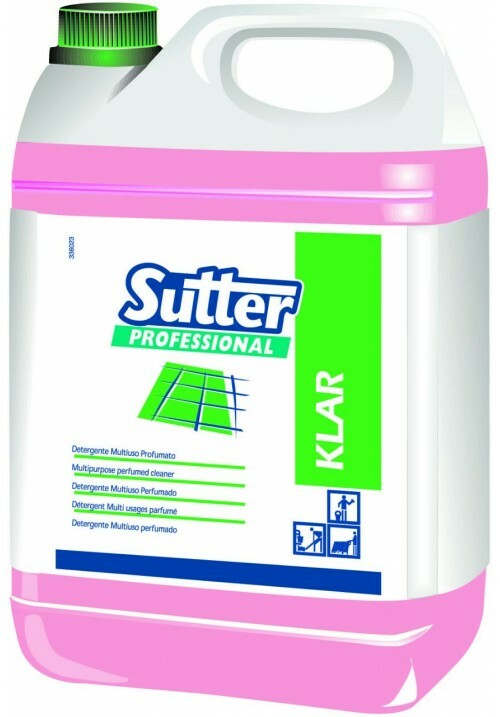 Product Code: Sutter KLAR - 5 Kg. Ecological multi-purpose perfumed detergent (All Purpose Cleaners). Quick and easy to rinse.It leaves shining floors. Versatile foam controlled high deodorizing detergent.Especially suitable for manual or mechanical daily maintenance of all washable surfaces, treated or untreated. KLAR is ideal for daily maintenance, communities such as schools, offices, hotels. Multi-purpose detergent for all washable surfaces and for the maintenance of all types of flooring, also protected. Particularly effective on coatings and health thanks to the anti-redepositante of the water. Optimal for tiles and walls in bathrooms and sanitary areas. For daily maintenance, dilute KLAR 1-3 %. With more stubborn dirt, increase concentration. In order to maximize the effect KLAR deodorant, spray or pour a few drops of pure product areas to deodorize. On stains use undiluted on a mop.